Although the urge seemed irrational, I have for many years wanted to visit Norway and its fjords. Perhaps, I thought, this urge came from memories of my brief time in Oslo during August 1966. I recalled the fjordian vistas that opened when a bus took me to the top of a mountain on the edge of the city. Or maybe it came from advertisements of Norwegian fjord tours that had wormed a message into my brain. A new theory of my itch to revisit Norway arose when I got the results of an Ancestry DNA test that showed eleven percent of my DNA is linked to Scandinavian ancestors. Maybe my interest in Norway was a genetic imperative, a call from the old country. Or maybe I was hearing voices of long-dead ancestors calling me home. Nonsense of course, but at least the DNA results provided a reason to head to Norway in October as part of five weeks of roaming Europe with a Eurail Pass (http://www.eurail.com/eurail-passes). Arriving in Amsterdam, I headed north, spending a few days in Germany. Then, I hopped on a train going up Denmark’s Jutland peninsula. After a night in Aarhus (http://www.visitaarhus.com/ln-int/denmark/tourist-in-aarhus), an intelligent-looking coastal university town that deserved more of my time, I took another train to the northern port of Hirtshals (https://en.wikipedia.org/wiki/Hirtshals), a bleak little wind-swept town on Denmark’s north coast, to catch a ferry to Kristensand (https://en.wikipedia.org/wiki/Kristiansand), located on the southern coast of Norway. Kristiansand is a modest coastal city in with a visit-worthy old town. From there, I intended to take a train going west to Stavanger (https://www.visitnorway.com/places-to-go/fjord-norway/the-stavanger-region/ ). However, the train was not running, and passengers were instead put on a bus. The three-hour bus ride passed along fjords, rivers, lakes, and streams, all hemmed in by crudely shaped bluffs and mountains. As the weather turned from cloudy to stormy to sunny, then repeated the cycle, the glimpses of the wild beauty and isolated towns were a nice introduction of the southern part of Norway. 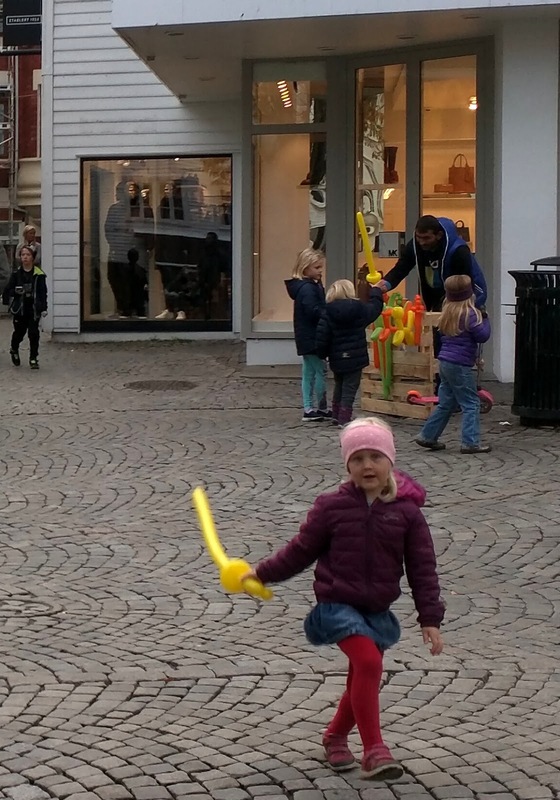 The Stavanger downtown is perfect for a traveler without a car. Within short walking distances from downtown hotels are the city’s old town with its prim, white wooden houses sitting on a slope going down to the harbor; its ancient central shopping district with narrow, crooked, rock-paved streets; and its colorful finger of its harbor. Of course, the downtown is just a small part of this prosperous, sprawling city of 128,000 people that is the center of Norway’s oil industry. Nevertheless, visitors like me most enjoy the chance to see evidence of its history. From the Stavanger harbor, I took a three-hour boat tour of the Lysefjord, a long and wide fjord. In truth, two of the three hours of the trip were in the Hogsfjord that is the path between Stavanger and Lysefjord. Hogsfjord shores are less mountainous and more densely occupied, apparently with summer homes for Stavanger residents. Lysefjord is the star attraction of the boat tour because of its dramatic shoreline with irregular mountain sides scraped out randomly by the thrust of icebergs and battered by thousands of years of wind, rain, waterfalls, rock slides, and who knows what else. Its featured attractions viewed on the boat ride were an outcropping far above the water called the Pulpit Rock and a huge waterfall (http://www.rodne.no/wp-content/uploads/2013/12/Kart-Lysefjorden-engelsk.pdf). As much as I enjoyed seeing them, I was equally attracted by the views of small isolated villages scattered in valleys along the edges of fjord. Whether fjords such as Hogsfjord and Lysefjord should be called “ruggedly beautiful” or “beautifully rugged” can be debated. Whichever description is most apt, the combination of irregularly shaped high bluffs surrounding deep blue water is striking and memorable. As I viewed these spectacular sights, my Scandinavian genes seemed quite pleased to be back in the old country.